Happy Anniversary, to my dear husband! Yes, it’s been 31 years today. 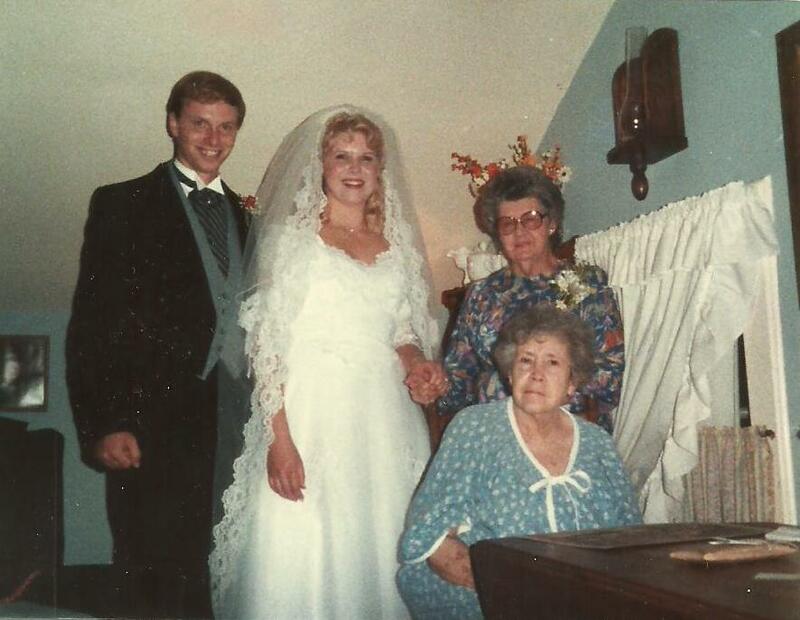 This picture shows my new husband and me after the wedding with my maternal grandmother and her sister, my great-aunt. Both have gone on to be with the Lord now. My grandmother was not able to make it to the wedding because of health issues, so we went upstairs to her room and had this picture taken. Both of these dear women are greatly missed in my life. My grandmother was staying with us, my mother caring for her in our home at the time. In the process of helping her in the bathroom, the toilet tank was broken. My grandmother’s room was above the living room. The reception was to be at the house. My mother had placed dishes of mints artistically around the room. You guessed it, the water, several gallons of it leaked through the ceiling and into the living room. Those mints were really pretty floating in their little dishes. So, my father, father of the bride, made a trip to town to purchase a toilet tank and spent the afternoon repairing the damage done. Yes, we made it to the wedding on time, rinsed mints and all. (Yes, my father actually suggested this to my mother. But they were thrown out.) The sun was starting its descent, the last rays glowing brilliantly when the two doors were opened and my father and I walked into that little, white church in that New England town. There stood my future husband, tall and handsome at the front of the church. Thus began our years together. I know celebrating 31 years is about ALL the years you have shared as a couple. I do remember and rejoice in those years as well. But my mind always goes back to that day in October, how young we were, how thin we were, how full of expectation and happiness for our future together. And that’s the way it should be. I love to think back on that day, all those emotions and relive them again. I pray I am able to do that until I am gone from this world. I keep our wedding pictures placed around our house…to remember where we started. To share that day with our children and now grandchildren…those people that God knew would share our lives someday but we were unaware of at the time. Happy Anniversary, dear husband. 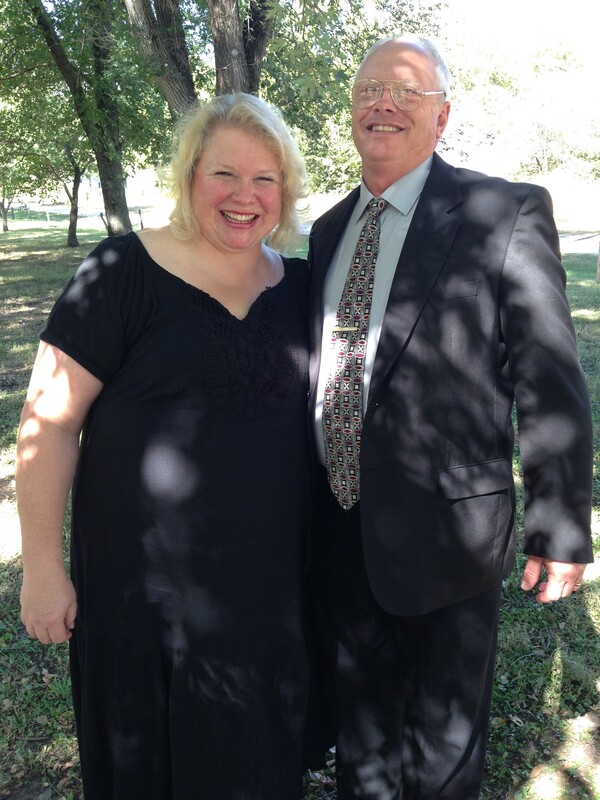 Thank you for sharing the past 31 years with me, not always by my side, but in my soul and part of me. I look forward to many more. And you know what? It really does just keep getting better and better! So many memories with that photo! Can’t wait to see them in heaven! What a memory. It’s funny now, but I’m sure you weren’t laughing on that day. I love hearing others’ love stories. Happy Anniversary, and I pray you will have many, many more. Love you!! Thank you, Julane! I love hearing others’ love stories as well and looking at their wedding pictures. Makes me feel all warm and cozy inside! Enjoy your special day as well…holding your new baby bird! Great picture of you with ‘Robin’. Love you!